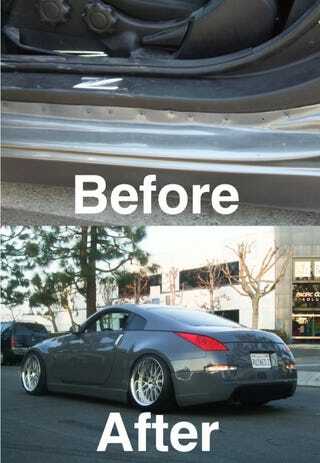 Ever read about the 350Z ruined after a shop installed a bodykit with wood screws and bondo? The owner's finally made it right with new bodywork, new paint and a new shop. That camber is on the "to do" list. The whole scandal created an epic 91-page thread over at My350Z.com last October, eventually leading to a lawsuit against the Los Angeles-area shop IDesign/Import Image. It's taken the owner over a year, but his Z has finally reached the stage he initially envisioned when he dropped it off one fateful night last October. Feast your eyes on the carnage a badly applied bodykit can wreak and the lovingly reborn Z in the galleries below.